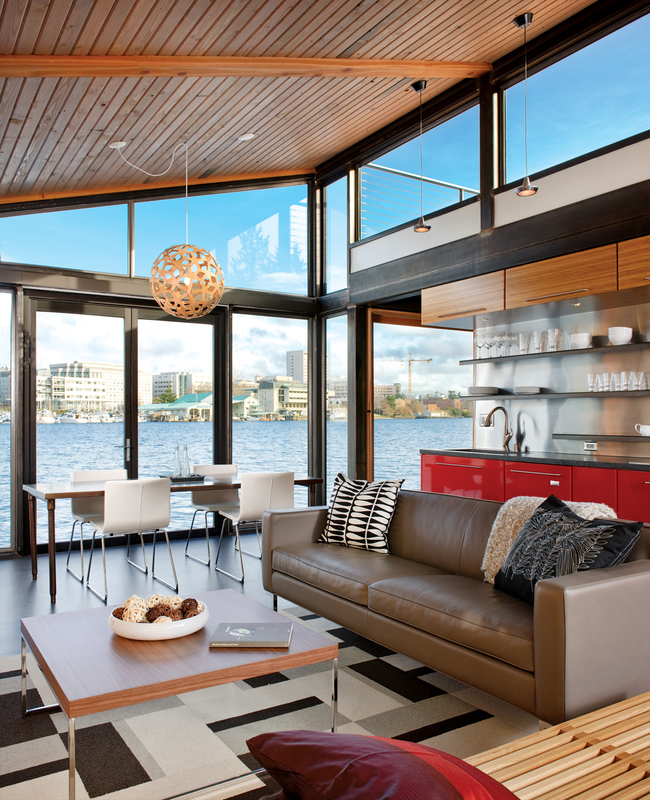 A once-plain floating home on Seattle’s Portage Bay receives a much-needed renovation ten years in the making. “I love being close to the water. 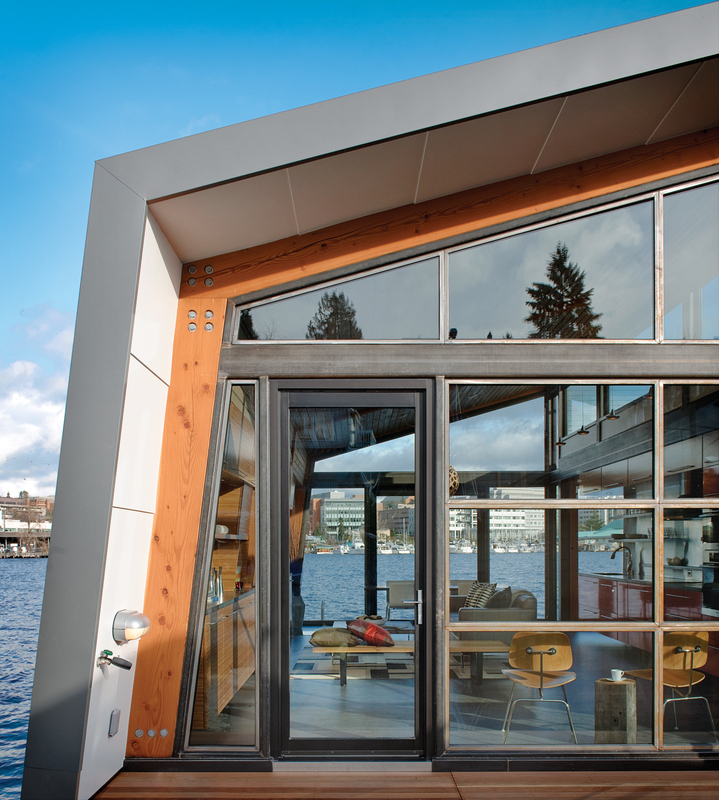 There’s constant change, with boats and wildlife passing by,” says Denise Draper about her floating home on Seattle's Portage Bay. Read the story on the renovation 10 years in the making here. The floor-to-ceiling windows at either end of a Seattle boathouse allow light to stream through the entire 1,000-square-foot space. In 1999, native Seattleite Denise Draper fell in love with the location of a prime end slip in a marina on Seattle’s Portage Bay. She was less enthusiastic, however, with the existing fixer-upper floating there. “I love being close to the water. There’s constant change, with boats and wildlife passing by,” Draper says, so she purchased the home. It took her ten years before she could renovate, but with the help of architect Ryan Mankoski of Ninebark Design Build, his wife, interior designer Kim Mankoski, and local builder Dyna Contracting, Draper ended up with a 1,000-square-foot place that’s tuned in to its surroundings and wears its strong sustainable ethos on its walls. Ninebark and Dyna salvaged as many components as they could from the original structure, including the turn-of-the-century cedar floats that buoy the home from below­—one of the 60-foot-long logs was milled and turned into interior finishes. On the exterior, they opted for salvaged Cor-Ten steel and cedar, both of which will age well in the notoriously rainy northwestern climate. With east-facing walls that are almost entirely glass, “I’m surrounded by natural light all the time,” Draper says. The interior is complemented by a 400-square-foot rooftop deck that provides ample views of the waterfront and the snowcapped peaks of the Cascade Mountains off in the distance.